Rock & Roll Will Never Die — If The Fabulous Hubcaps Have Anything To Say About It. 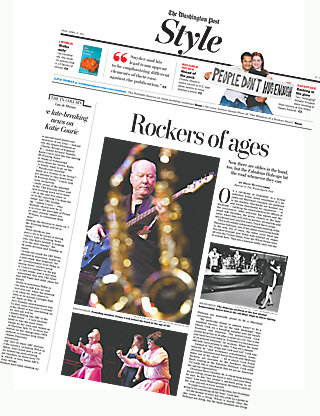 My piece on the Fabulous Hubcaps takes over most of the front page of the Washington Post Style section today. The assignment called for 1,200 words. I wound up with nearly 13,000 transcribed words. So I think I undersold the piece. Coulda been a magazine feature, ’cause there was sooo much fascinating, fun, and relevant info that did not make the cut. I will say that I’m glad to be able to use the serial comma again. Also, when will publications stop putting a K in the abbreviation of microphone? It’s mic, not mike. Mike is a person. But these are personal peeves and not aimed at any of the fine staffers and friends at the Post. Go, newspapers!